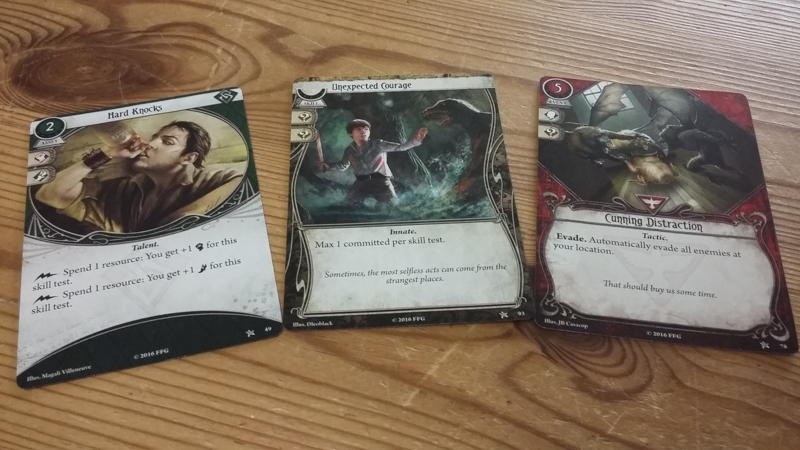 This Arkham Horror: The Card Game review is a guest review by Sarah from Nerdling Mum. Thanks Sarah! Arkham Horror: The Card Game is a game set in the Lovecraftian world. In it you play investigators in your hometown of Arkham. You have banded together to investigate some mysterious disappearances and deaths. You explore the story by using a customisable deck of cards, which reflect your different abilities but also contain two weaknesses which might overcome you. As you progress through the story you will battle strange creatures and face many of your own fears. This game is described as a living card game, which means that the publisher will be regularly releasing new content, in this case new scenarios, new investigators and new player cards. Whilst the game story can be played with up to four characters, you can only play two characters with one copy of the game. If you wish to play with more than two characters, you will need another copy of the base game so that you have enough cards to complete the character decks. 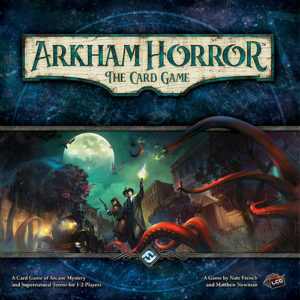 Arkham Horror: The Card Game is a campaign game which means that the outcome of each scenario has lasting implications both on your character and also on the town of Arkham itself. On a positive note this means that you will earn experience when you complete a scenario, which enables you to purchase better cards for your deck. However, you might also gain permanent scars, both physical and mental. The base box contains one campaign with three separate scenarios. As players investigate the mystery, they will be trying to progress through the Act deck. Each card in this deck will explain a part of the story and contain the objectives the players will need to work towards. 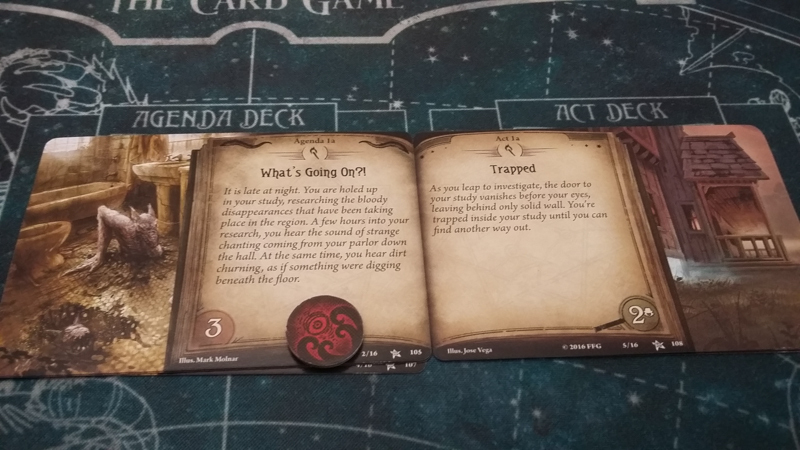 There is, however, an Agenda deck that represents the impending doom upon Arkham and the investigators. This also contains a story element with objectives the players will not want to trigger! Each scenario also takes place at specific locations represented by cards. These remain on their unrevealed side until an investigator moves to that location. Entering locations can trigger different effects or there may be clues there that the players need to investigate. The scenario also details a number of other cards which are shuffled together to form an encounter deck. These represent those monsters and nasty effects which will affect the players as they progress through the game. 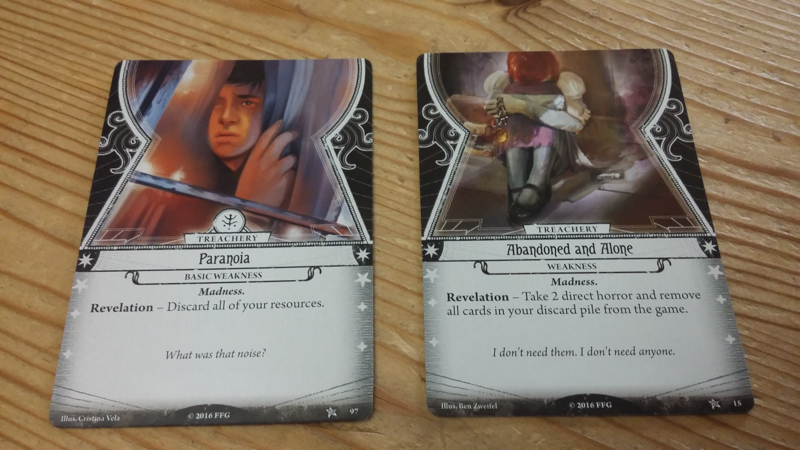 Each scenario has a different mix of cards for its encounter deck. There are 5 different investigators to choose from in the base game one of each class type. The classes are Guardians, Mystics, Rogues, Seekers and Survivors. Each of the characters are able to add cards to their deck from another specified class. The back of each investigator card sets out the details of how to construct your deck. For ease of set up and first play there are starter decks listed in the rules. There are three kinds of cards which make up a player deck: Asset, Skill and Event cards. Assets are things like items or allies and are placed into your play area. Skill cards are usually things that the investigator knows and are committed to skill tests. Lastly, event cards represent other actions that an investigator might choose to use. Each player will also have two weakness cards in their deck, one specific for their investigator and one basic weakness chosen at random. These can affect the player at anytime when they are drawn into your hand during the game. All of the cards in a players deck (except for the weakness cards) can be used in one of two ways; they can be played for the specific ability listed or played to modify a skill check. In order to play a card from your hand for its specific ability a player must pay the relevant resource cost as specified on the card. Each investigator has four skills: willpower, intellect, combat and agility. During the game various situations will require players to make a skill check. This is done by drawing a random token from the chaos bag. 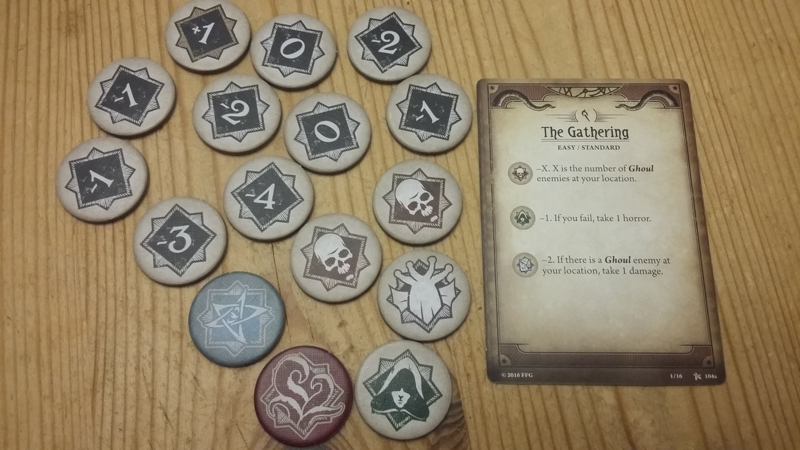 The chaos bag is assembled at the beginning of the scenario, the tokens used represent the difficulty level (Easy, Standard, Hard or Expert). Each scenario details the specific tokens that should be used. The tokens themselves may simply have a number modifier (such as +1, 0 or -2) or they might have a symbol. One of these is an automatic fail, one refers to your characters specific ability, and four others have varying effects depending on the scenario. It is possible for players to commit cards to their own skill check or that of another player. Cards committed must have matching icon(s) on the top left hand side of the card as the skill check being performed. Each matching icon increases the investigators skill level by 1 for that test. Each round of the game has four phases: Mythos, Investigation, Enemy and Upkeep. In the mythos phase a doom token is placed on the current agenda card and then you check to see whether the card has met its objective. If so you turn over the agenda card and see what nastiness awaits. Then each player draws a card from the encounter deck and resolves it. The next phase is the investigator phase where the players each have three actions. It is up to the investigators to decide who goes when in the turn order. On your turn you can choose to draw a card, gain a resource, fight a creature, move locations, investigate, or play cards from your hand. After the investigators have all played, it’s the enemy phase where creatures can move and attack. The last phase is the upkeep phase where cards are unexhausted, and new cards and resources are gained. I absolutely love this game. What drew me in was the story. I have a weakness for games with a story telling component. I like the way the story progresses as you play through the scenario, but I also love the way you can finish the scenario, read the resolution and not really know how well or badly you actually did. It’s not until you start the next scenario and realise that things are much more difficult because of what you did or didn’t do last time and perhaps you didn’t do as well as you thought! It’s also fun looking at the experience you’ve earned and thinking about what new cards you could buy for your deck. My husband is much more interested in deck-building than I am and I would say that this is one of his favourite things about the game. Another element that I really enjoy is the choices about when to play certain cards. Do I help a friend with a skill check now or is it better that I hold onto this card to play it for its ability on my turn? I love collaborative games which provoke discussions about what we need to do next and this game definitely does that for us. Should we go here and battle that monster? Should I try and evade them first so they cannot attack back? As each player has their own cards it means that no one player can really dominate those discussions so everyone will have their own suggestions. I also like the dread of knowing that your weakness is in the deck and the chances are that you might draw it right at the worst time. Then just sometimes it comes out at the best time or perhaps you don’t draw it at all. These weaknesses can really change how a scenario goes depending on when you draw them. There are in addition times when the game alters your deck by perhaps adding an ally or by adding a curse. 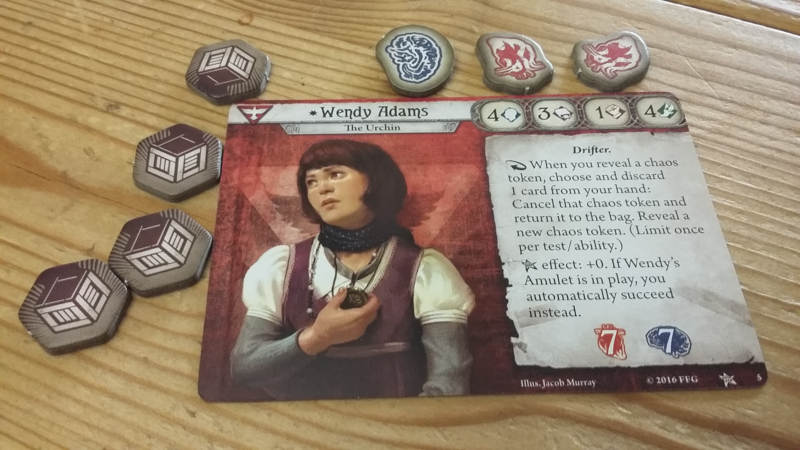 This is a mechanic that I really like as it adds to the investigators story. 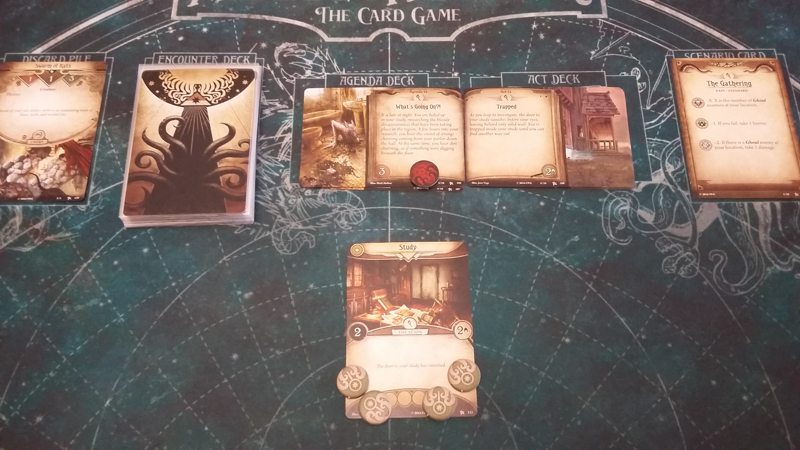 I have been playing Arkham Horror: The Card Game both as a two player game with my husband but also as a four player game with friends and I have been very impressed with how well it scales between them both. I haven’t noticed it being easier or harder either with two players or four. I do feel however that it was a shame that they didn’t include enough cards to play this game at four players. We are lucky enough to play with friends who purchased their own copy of the game and as such I cannot see that we are likely to ever buy another copy. But again, this is something you might want to consider. Another minor criticism is that the game can take quite a while to set up, but this can be mitigated by spending a little time organising the different cards. When I first played this game I was concerned that I couldn’t see us playing the original scenario repeatedly as the story would be the same even if the encounter deck and the outcome might be different. This certainly seems to have been the case for us. We have been playing steadily through the new expansions rather than repeating the stories again. Now this might not be the same for everyone but I feel it is something to bear in mind. I do think that this game should come with some sort of disclaimer as it is awfully addictive. Every time something new is produced we have to buy and play it! It is definitely a huge money sink if you’re at all the type of person who must collect everything! Thanks for taking the time to read this Arkham Horror: The Card Game review! Sarah is a “nature-loving geek” from London who enjoys writing about board games, computer games, and books. You can find her on Twitter, Pinterest, and, of course, at her blog.